Today is both Pancake Day, and Sticky Bun Day. What, you say, but wasn’t Pancake Day earlier? Yes, but that was religious pancake day. And also there is yet *another* pancake day coming up later this month, on the 27th, because 2 Pancake Days apparently weren’t enough. Clearly all these National / International food day calendars need to coordinate better. Or maybe I wrote this one down wrong when I was making out the plan for the month. Who knows! Who cares! We’re doing pancakes again! But I digress. 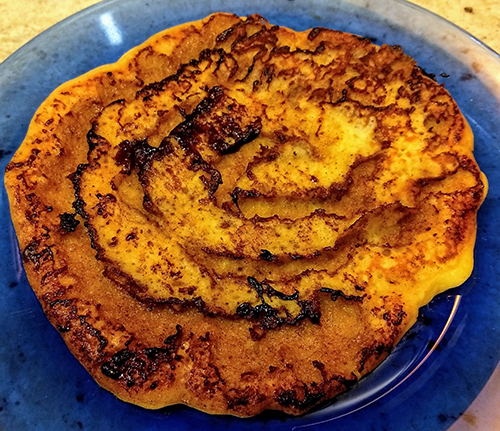 These are two foods that are easy to combine, if one goes by not only the recipes on the internet (all hail the repository of all information no matter how obscure or weird), but also the fact that several restaurant chains actually have a Sticky Bun Pancake on their menus. The concept is pretty simple. You make up a basic pancake batter and pour some onto a heated, prepared skillet. Then you squeeze a mix of melted butter, brown sugar, and cinnamon on the top, in a swirl. That cooks for a bit, and then you flip it over and try to avoid making a giant mess, since the swirl mixture, as it heats up, gets all liquidy and is highly prone to splattering everywhere. 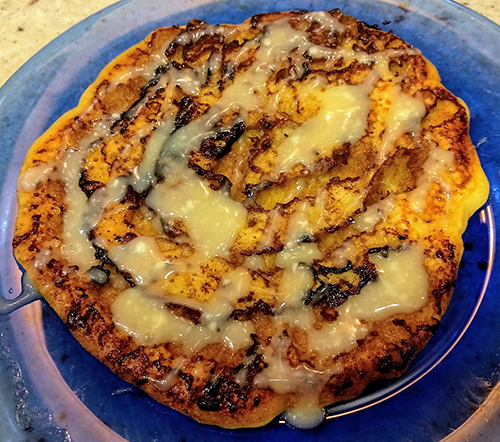 When it is done you have a giant pancake that sort of vaguely resembles a cinnamon roll. And when I say ‘giant’, I mean that one pancake takes up most of the plate. I’m used to making much smaller pancakes, but this recipe only makes four of them, which should give you some idea of how big they are. But wait, this can’t possibly be the end, can it? No, no it cannot! It’s not remotely over-the-top sweet enough yet! 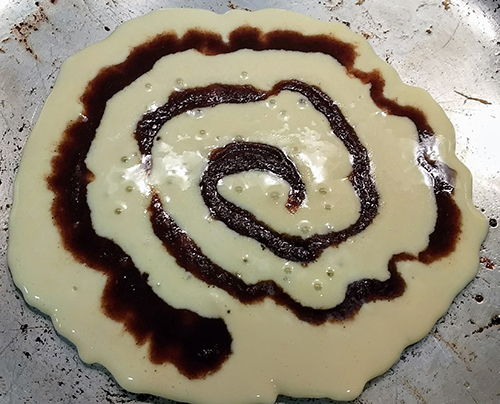 Because once the pancake is on the plate, then you add the final touch, which is a generous drizzle of cream cheese glaze. There. Now it looks more like a (strangely flattened) sticky bun. Verdict: They were tasty, for a ginormous cinnamon roll/pancake sugar bomb, but we both agreed they were far too big, and much too sweet. In fact, I didn’t even bother making the remaining two pancakes in the recipe, to save for later, because we really weren’t interesting in having them again.